You've probably heard of lemongrass before, right? Maybe it's been a scent on some candle you bought one time, or just a flavor in your order of Pad Thai. But did you know that the essence of lemongrass can actually help you fight off pests in your home? Check out our guide below to learn all about this essential oil and how it can work for you. What Are the Benefits and Uses of Lemongrass Oil? Which Products Use Lemongrass Oil? When Should You Consider Using A Lemongrass Oil-Based Product? Is Lemongrass Oil Dangerous To Humans? Is Lemongrass Oil Dangerous To Cats? Is Lemongrass Oil Dangerous To Dogs? What Does The Government Think About Lemongrass Oil? Lemongrass oil is, honestly, pretty straightforward: it's oil which is distilled from lemongrass crops. This is a perennial grass grown mostly in Asia, but can also be found in parts of Australia, Madagascar, and Guatemala. It's characterized by its thick stalk and citrus-like aroma, which—when distilled—boasts medicinal properties. Lemongrass oil contains a high concentration of a chemical component called citral, which works as a pesticidal agent. In essence, the presence of citral guarantees the lemongrass's toxicity; killing the targeted pests without killing surrounding vegetation in the process. Lemongrass is ideal for pest control due to its antifungal and antimicrobial properties. This means that it effectively blocks the spread of fungi and microorganisms carried by pests in the home. In addition to this, many insects are repelled by the citral content in lemongrass. In some instances, lemongrass oil has even stacked itself up against DEET to provide protection against predatory mosquitoes. If you have chronically greasy hair, it may not seem like the most logical thing step to put an oil in your hair to combat the grease, but then again, essential oils aren't necessarily "oil" in the traditional sense. They're more like essences of a plant, and don't usually give off the greasy feel that oils tend to leave behind. Lemongrass oil can be mixed with shampoo in small quantities to fight oily hair, or used on its own. Simply rub a few drops into your fingertips and work evenly through the roots. Just like with oily hair, lemongrass oil can help to ease the discomfort of an oily face. If you have problems with acne, a few drops of lemongrass oil can aid you in drying your skin and cleansing your pores naturally, which will clear the skin of the particles that block the pores and cause the blemishes. Be careful, though, because lemongrass has the ability to work a little too well on skin; it can dry your skin out substantially and leave the epidermis starved for moisture. In turn, this can cause irritation and pain. If you have bees on your property that you've been trying (and failing) to trap, you may need to attract them with a secret weapon. Honey is widely regarded as an ideal lure in the world of pest control...but what can you use to lure in the pest that produces the honey?? Good news: bees find the scent of lemongrass attractive! If you create a bee liner by using lemongrass oil, you can effectively use this to lure in bees to a trap and get rid of these guys fast. The use of essential oils can also be referred to by its more common name: aromatherapy. This practice is gaining traction in this day and age, for a multitude of different reasons. While each and every person has their own different grounds for turning to aromatherapy, one factor remains constant: it's an alternative to scientific medical care. As such, its practices are not regulated by the FDA and not backed by scientific data. Any and all information given regarding aromatherapeutic practices are based on the claims of those who have experienced them, not scientific fact. Lemongrass has been shown to relieve pain, act as an anti-inflammatory agent, an analgesic, and stimulate the body, particularly weak tendons. Is lemongrass oil normally sold on its own, or is it generally used as an active ingredient in other products? Check out the section below to learn more about where you'll find this essential oil. In its most raw state, you'll find lemongrass oil sold on its own: unrefined and ready to be dispensed. Most online retailers sell small bottles of pure lemongrass oil, and many health food stores carry it as well. Some grocery stores with a healthy living section will carry this, and big-name stores like Whole Foods will usually have bottles in stock. Check out how you get lemongrass oil from actual lemongrass in the video below. This type of product is specially designed for skincare: coconut oil is generally regarded as one of the top natural moisturizers out there, so by combining lemongrass oil, the manufacturer is marketing this product to those with chronically oily skin. The lemongrass oil infusion promises an "uplifting and toning" effect, which doesn't stray from the effects that this essential oil normally gives off to other uses. There are a few different insect repellents on the market which are blended with different essential oils to create a natural, non-toxic options to keeping the bugs at bay. These repellents present a chemical free option to enjoy the outdoors, particularly as mosquito season ramps up. Because of the aforementioned concentration of citral, bugs are no match for lemongrass essential oils and will more than likely stay away from anyone with a healthy smattering of it on their skin. Why should you consider this oil over traditional bug spray? Well, for starters, it seems like we're all looking for a greener option to fight off the bugs these days. Keep on reading to see how lemongrass oil can combat bugs without the use of harsh chemicals. In a recent study conducted by the University of New Mexico, lemongrass oil was shown to cause substantial mortality rates to mosquito larvae when tested in laboratory settings. Lemongrass oil "bombs" were hidden inside of baker's yeast, which are a preferred food source for a larvae sacs. After the larvae ingested the lemongrass oil, their guts bursted open and they died, indicating that lemongrass oil is substantially lethal to these insects. Lemongrass oil is used as a main ingredient in several different types of flea medications for both dogs and cats. Fleas are irritated by the presence of the citral in the lemongrass oil, which works to overturn the infestation of fleas on your furry friend. At this point, it seems like lemongrass oil much more beneficial than harmful. But is this the truth? While this essential oil has significantly less side effects than a chemical concoction, it's not without its faults. Keep reading to familiarize yourself with the risks involved when you have too much of a good thing. As we mentioned earlier, lemongrass oil can dry out skin substantially if misused. This can lead to painful skin rashes and irritation, which can—if you think about it—add up to more trouble than it's worth. In addition to this, lemongrass oil can leak into the eyes and present serious problems with vision and ocular irritation. According to the American College of Healthcare Sciences, all essential oils have a therapeutic margin and a toxicity scale. When you're pregnant or nursing, it's best to err on the side of caution and either refrain from using essential oils, or only use those with the lowest margins and toxicity. In another post, the ACHS warns that expectant mothers should dilute concentrations of all essential oils (should they choose to use them) to a 0.5% ratio. Lemongrass oil has a low toxicity profile for humans, and there's no scientific indication that it can be detrimental to a pregnancy. However, it's best to use your own sounds judgment on whether or not to use this essential oil during your or your partner's pregnancy. Here's a quick explanation of why there's so little data out there on how essential oils effect pregnancy, and why it's best to simply take the lowest dose possible (or completely abstain) while pregnant. The ACHS does not recommend diffusion of lemongrass oil around babies. The reason for this is that the smell can be overpowering, and babies don't have the communication skills to alert an adult, or the power to get up and walk away. ...these same products can also cause some serious side effects. Here're a couple example products we found that actively use this essential oil. Pet spray. 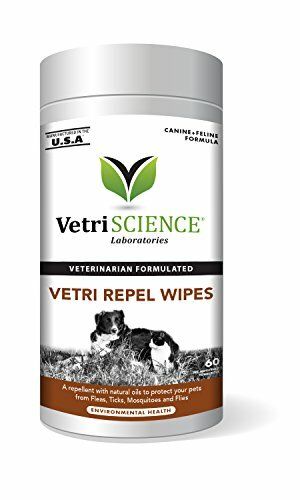 This stuff works as an "all natural" flea and tick repellent that doubles as a cat deodorizer. The lemongrass oil pairs with citronella oil to ward off fleas, keeping your cat simultaneously smelling fresh everywhere it goes. Pet shampoos. These lemongrass oil-infused shampoos are designed not only only give your cat a bath, but give the fleas an extra kick out the door. Towelettes. Pre-moistened towelettes are sold in packets to wipe onto your cat and administer the lemongrass oil in order to fight off the pesky fleas. Dogs, too, can sometimes fall victim to lemongrass oil poisoning if they've gotten too much exposure. While there are several products out there with lemongrass oil as the main ingredient in the fight against fleas and ticks, always be mindful that "green" doesn't necessarily mean "safe." 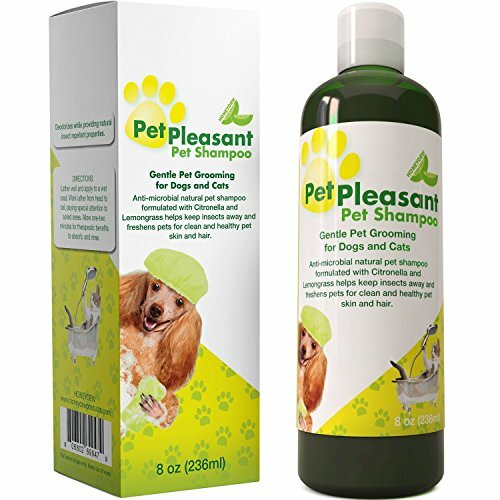 Here're some example dog products that use lemongrass oil. 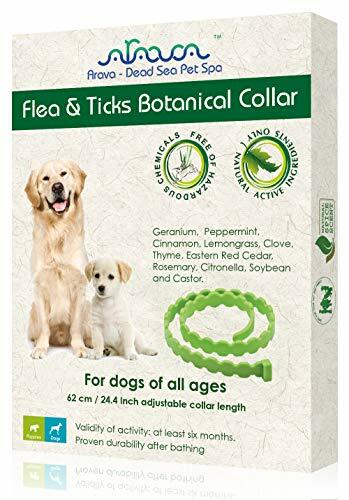 Flea Collars: These specialized collars are developed just like traditional medicated flea collars: designed to sit around your dog's neck and release the active ingredient over months at a time to eradicate fleas. The only difference is that these collars release lemongrass oil instead of a chemical. 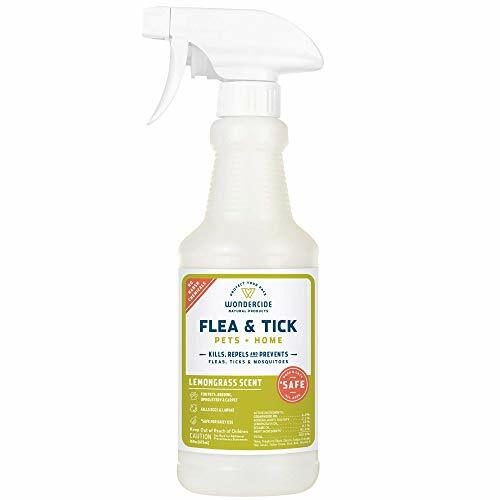 Flea and Tick Sprays: Just like for cats, dogs can be sprayed with these anti-flea sprays as well. Oftentimes, there is a multi-animal lemongrass oil spray which can be used for either dogs or cats. A favorite we recommend is called Wondercide, as shown. Towelettes. Dogs can also be wiped with these specially-formulated towelettes. They're normally sold in packs of either 30 or 60, and meant to be used daily. As we mentioned earlier in the fact sheet, because lemongrass oil is an essential oil, it's not regulated by branches of the government like the United States Food and Drug Administration. But what do some of the other branches of government have to say about it? Lemongrass oil is not registered with the EPA as a pesticide. However, it was found on a list of Active Ingredients Eligible for Minimum Risk Pesticide Products. These products can be considered active ingredients in some pesticide products, but are exempt from the Federal Insecticide, Fungicide, and Rodenticide Act (FIFRA). When checking with the CDC, however, one can see that lemongrass oil, when blended with other essential oils, is recommended as a natural tick repellent and pesticide. Check out the section below to see how lemongrass stacks up against its competitors in the green sector. Though lemongrass and tea tree oil both have strong antifungal and antimicrobial properties, there's one key difference between the two, and it's worth knowing. Lemongrass oil and highly irritating to be applied topically to the skin in large amounts. It should only be used very sparingly for maximum results. Tea tree oil, on the other hand, is ideal for wounds, burns, and skin irritations. Topical application is recommended and encouraged for healing. They may sound the same, but these oils are a bit different. For starters: lemongrass oil repels insects...but in case you forget to apply it before you embark on that hike, lemon oil has got your back once you return. It's perfect to soothe the bug bites that have already happened, whereas lemongrass oil is better at preventing them in the first place. Lemon oil boasts the ability to deliver a "lifting boost" of mental clarity, and lemongrass oil takes a much more concrete approach—clearing away the storm clouds of headaches and anxiety. Though it's commonly believed that lemongrass and citronella oil are the same thing (with the name simply swapped out interchangeably), this is a myth. Lemongrass oil is derived from lemongrass, which, to get technical, comes from the species Cymbopogan flexuosus. Citronella oil, on the other hand, is derived from two grasses of the species Cymbopogon: C. nardus and C. winterianus. The simple version: lemongrass and citronella are very closely related, and look very similar to one another...but they're just not the same. If you're looking for a greener, non-chemical way to rid your house of pests, get rid of some problem pimples, revitalize your hair or even tone down your anxiety, lemongrass oil can definitely help you out with that. However, you need to make sure that you use it correctly. Too much topical skin contact can lead to abrasion on the skin and painful side effects, not to mention a possible eye infection. If you've got pets or kids in the home, there's even more of a reason to stay vigilant. Always remember: just because a substance is a non-chemical doesn't mean that it's non-harmful. Use caution and always use products as directed in order to keep yourself and those around you safe.